ICAI declared CA IPCC result May 2015 on 31st July 2015. 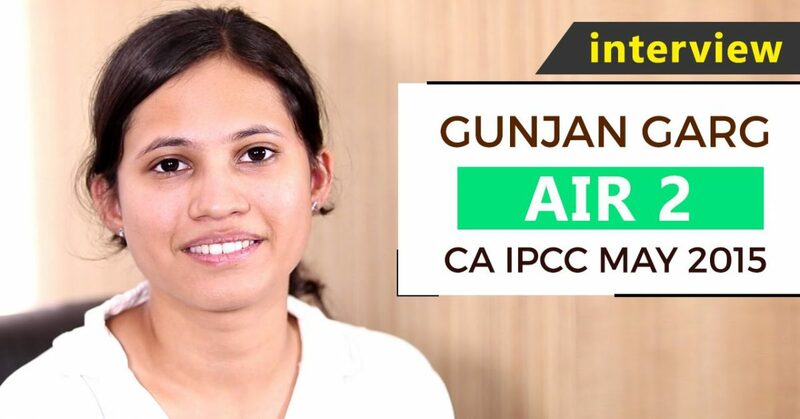 Gunjan Garg got all India 2nd rank with 553 marks. She prepared for IPCC Exam at Vidya Sagar Institute (VSI) Jaipur, Rajasthan. Gunjan, first of all, many congratulations to you. QWhat was your first reaction when you saw your result? Initially, I could not able to access my result, Perhaps I was typing wrong roll number in nervousness.I first got this news from my juniors at VSI. It was hard to believe because I was literally not expecting this and when I finally saw my result I was so happy. I quickly got myself ready to head over to VSI to celebrate.I was feeling on top of the world. I was very happy to see my parents proud of me. QIPCC Pass percentages are very low around 4-5 % and it is a big deal to clear IPCC exam in the first attempt so What was your source of inspiration? and To whom you want to give credit of your success.? There was not any role model or inspiration as such but It was in my heart that I have to do something great. I want to give credit to my family...my grandmother and my aunt. They supported me very much. and my friends also helped me a lot in studies. Then I would be very thankful to my institute and R.C. Sharma sir. He called me after every exam and motivated me to focus only on next exam and forgot about the past papers. All these things contributed to my success. QHow many hours you studied daily and what was your strategy during the examination? It was in two phases. Initially, in the first phase, when coaching was going on, I used to study in coaching and used to revise it daily after coming back home. I used to give VSI IPCC Mock Test Papers during my coaching that used to happen 4 times in a session. Each one covered 25% of the syllabus. I covered the part of the syllabus completely for each exam. and I never missed even a single mock test paper. And in the second phase i.e. in December when the course was 100% completed. I started solving more VSI mock test papers and I used to study for like 12-13 hours a day till the exam. QWhy you choose VSI Institute? Initially, I was very confused about whether to join coaching or join different classes for different subjects. But my family told me to join VSI Institute because there I could find all study materials, expert teachers and most importantly VSI mock test papers, that I could not find anywhere else, all at one place without wasting time and energy. QWhat messages would you like to give to those who are preparing for IPCC? To all the IPCC students I would like to say that you can't do anything in the last moments. so study regularly and practice mock test papers. The papers will help you a lot in understanding the paper patterns and developing time management skill to solve each of the six questions in exactly half an hours. Completing the course quickly and practicing more mock test papers is really important. that's it. QAIR 1st rank is also from your institute do you know her and if yes, was it competitive? Actually, We were in the same batch. We both enrolled into VSI first IPCC batch just after the announcement of our CPT result. The competition was very tough in our batch. So there was a neck to neck fight between all of us. That competitive environment encouraged all of us to score marks at most. Then the test series, study patterns all were same for both of us so I think that could be the reason we both ranked in IPCC May 2015.